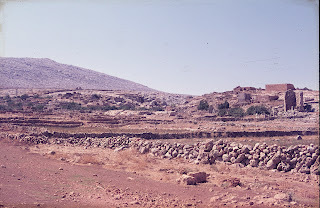 The Aerial Archaeology in Jordan project has been in action since 1997, but before that David Kennedy was visiting sites in the Near East for his own enjoyment and research. Most of the images he took on the ground were processed into slides. Slides are a thing of the past, and not the best way to store your negatives, and it is now one of our projects to digitise this collection and add it to our online archive. 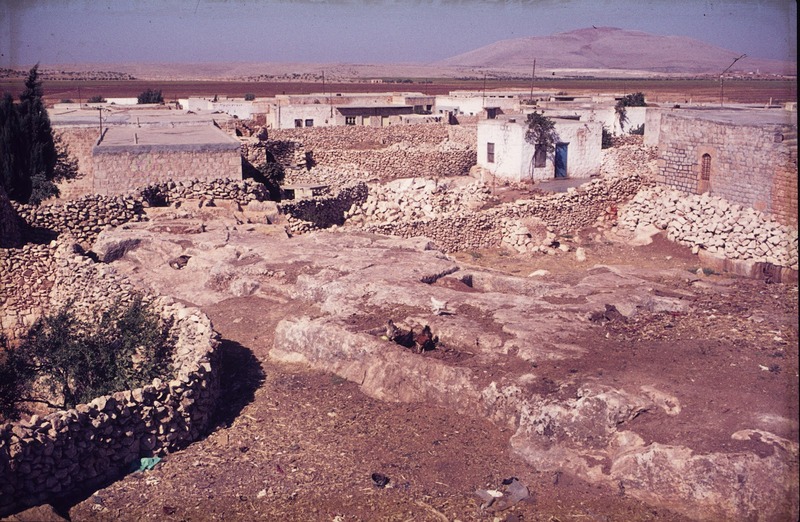 The slides I have been starting on are photographs from Syria, taken in the 1970s, and have not been stored in optimal conditions. The 35mm negatives are mounted between thin glass within a slide frame, and then stored in slide sheets in a filing cabinet. Most slides have developed a sticky, oily residue from the interaction with non-archival plastic slide sheets, small spots of mildew have started to appear on the slides, and the colour of the slides has started to degrade, developing a magenta tinge. In some cases, the glass mounting has shattered, scratching the negative. 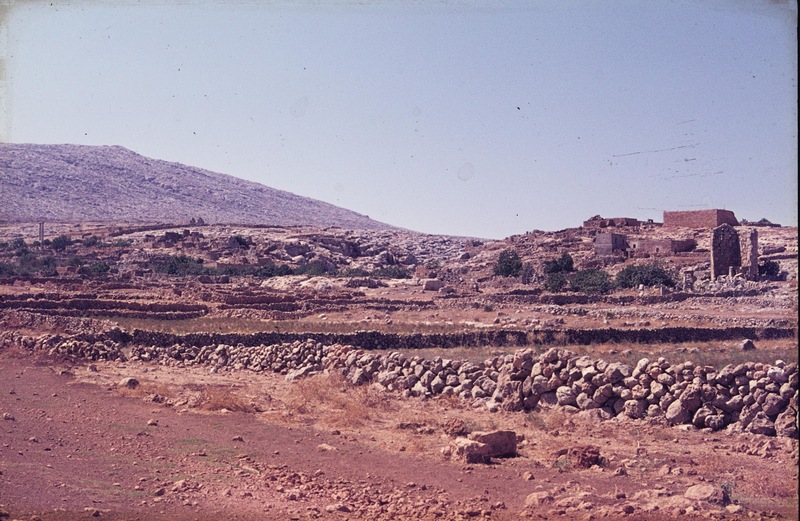 Slide scan of rock cut tombs in Dawa, North West Syria. c.1978. The remains of the oily residue can be see along the edges of the frame. Photography: David Kennedy. Click to enlarge image. 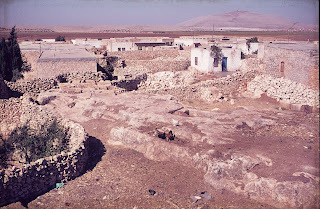 Slide scan of Qatoura, North West Syria, c.1978. Mildew spots and scratches to the negative can be seen in the blue of the sky above the town. Photograph: David Kennedy. Click to enlarge image. A preliminary cleaning of the slides to remove what we could of the oily residue could not clean the frame well enough to remove all traces of the residue, and this did not tackle the minor mildew problems. With advice from the State Library of WA Conservator, we will be using a 50:50 solution of Ethanol Absolute and Deionised Distilled Water to clean the slide frames and glass mounting. This same solution can be applied carefully to those negatives that have been effected by mildew - but we must be careful not to let the solution interact with the emulsion side which could cause permanent damage to the slide. The ethanol solution will evaporate quickly and leaves no residue. Once the slides have been cleaned and scanned - we hope that we will be able to edit the images individually to correct any permanent scars such as scratches, or any traces of dust that may have come through during the scanning process. Colour correction will be used to minimise the effects of the magenta tinge. We shall let you know of our progress. Any advice is most welcome.